Jacques Courtois a.k.a. "il Borgognone"
This fascinating and enigmatic "Battle", tumultuous and relentless in its twisted and dense action, balanced in their orchestration, so intimately engaged in the wide landscape background, stands as a masterpiece of Borgognone, but at the same time put some questions about the manner and timing of its execution. In fact, the typological analysis convincingly takes us back to his hand, given the opportunity to prove its authenticity, examining stringent comparisons for various single figures, once isolated from their context, as well as his ability to fit the many figurative elements of the masses, while always maintaining their clear legibility. That is the ability to convey to the viewer the veracity of the event of war, until almost to a participation, which then constituted the key to its success. So in the face of such a wide explanation of these qualities, we can say already describe how perfectly controlled their means, we should be led to consider this "Battle" is an example of maturity, however, being contradicted by other considerations. The battle takes place with cold, not a free choice of the painter, but in accordance with its historical setting, even if does not, at least to myself, to connect it to a specific biblical event or 'classic', the roman history, or more likely back through the centuries, as generally means the glimpse of the temple on the left. 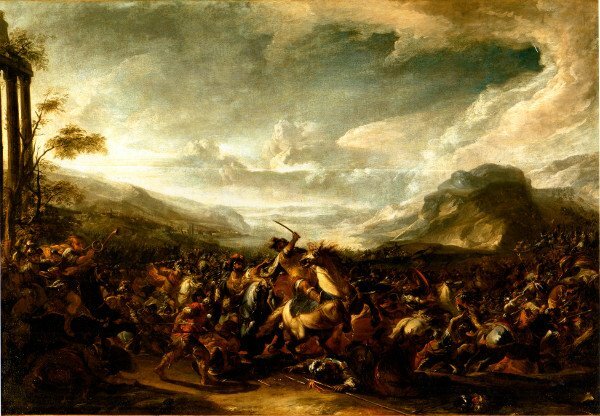 More than the Cerquozzi, Borgognone is influenced by Salvator Rosa, who reconnects more intimately this "Battle", in which the right side we see the retreat of one of the two 'parts' in the field, which continues until the narrow gully that runs alongside the curious promontory, in which the opposite delineation you might be tempted to see a leonine profile. The army that replicate is led by a king presumably antagonist of a Christian army, considering the small half-moon hoisted on his auction. A character, however, relegated into the background, is the epicenter of the battle focused on the clash between the knight on his white horse reared up and his opponent with golden breastplate and plumed helmet of red. Episode appears to be the decisive one of the "battle", 'starred' evidently by leaders of the two armies, in contravention of this new concept of the "battle without heroes" coined by Saxl (1939) for the Falcone, and in fact then mostly followed by the modern "battaglisti", such as other genre painters. We have conflicting indications for the purpose of chronological placement of this "Battle". But it is clear that it was realized for a precise relevant commission, which has motivated a singular explanation, which includes a large format, not so frequent in the catalogue of Courtois. So about the timing of its execution, stressing the difficulty in scaling chronologically intense production of Courtois, it seems useful to point out other salient aspects of this unique representation. In addition the ascendant of Rosa, as already pointed out an essential source for the maturation of the Borgognone, there is also a focus on the Falcone, detectable even in his works certainly advanced, and opposite a consideration for the strand 'conservative', represented mainly by the "Battaglia di Costantino" by Pietro da Cortona, updated edition of the fresco by Giulio Romano. Factors that lead us to a non-advanced stage, but also to exclude juvenile execution, marked by a stylistic trait and pictorial more careful and precise, linked to its origin and the influence of Nordic painters such as Asseljn or Cerquozzi. A first phase exemplified by the two pairs of Roman galleries, Capitolina and Spada, certainly among its first specifications Roman commissions, as rightly pointed out by E.L. Holt still in his fundamental article on Courtois, 1969 (The Jesuit Battle - Jacques Painter Courtois le Bourguignon, "Apollo", march 1969). Our "Battle" is instead characterized by a make over wide and loose, with a performance before - when you hear the decisive contribution of the knowledge of the great "heroic battles" of Luca Giordano - already finished but those its typical color glazes which are essential in his capacity as painting, and certainly the highlight of the details. But the aspect that is truly unique is the natural setting of such a vast and enveloping breath. It is worthwhile to note that initially the interest of Jacques was parallel for "battle" and "landscape", a resonance evidently designed for the representation of an exceptional event, at least in the intentions of the client	and in the payment of the painter, we can find only in the series of four "Medici battles". In which, however, is not given to incorporate that inspiration and that intimate mixture between the principal and the space that permeates this "Battle", while allowing us to indicate a convincing dating the same years, those years of intense labor that befell the painter after the sudden and somewhat mysterious death of his wife Maria Vaiani: poisoned by him as suggested by Orlandi, but not finding the slightest confirmation at the previous biographers and therefore more reliable. The relationship with his wife, however, had previously cracked, so his sudden death threw the painter into a deep despair, causing it to traveling widely in Europe, before entering the Jesuit order in S. Andrea del Quirinale in December of 1657, only thirtyseven years old. A period of labor that did not prevent him to continue to play a sustained	activities, which include the four "Battles" from the Old Testament, made in Venice to the Doge Nicola Sagredo. Works at the time lost, but that are annotated as painted on leather (a technique that I had the opportunity to examine one of his invaluable example). As a contradiction to considerations of A. L. Saxl on "battles without heroes" painted from Cerquozzi and Falcone, and then still predominantly well as by Courtois, this "battle" has its two well-emerging at the center of the scene, although at the moment they remain anonymous.